Let this fantastic classic 3 reel game take you back to the glory days of slots. Click here to play! Drop your coins in the slot and pull the lever for a chance to win some pretty decent cash. 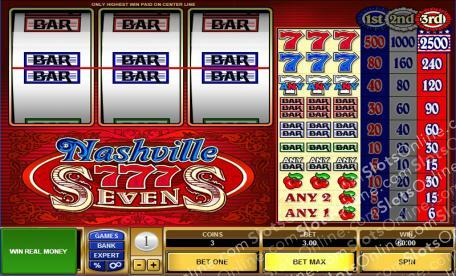 In a game called Nashville Sevens you can certainly expect an appearance from the lucky seven. It's the top earner in this single line game. Spin three red sevens across the pay line and you'll win up to 2500 coins. Spin three blue sevens and you'll win up to 240 coins. A combination of the two sevens across the pay line will get you 120 coins. Of course, it wouldn't be 3 reel slots without BARS. Triple, double, and single BARS are here as well. The first will grab up to 90 coins, the second will get up to 60 coins, and the third will get up to 30 coins. There are also cherries and a few combinations that will help you spin in the wins. The most important thing to remember about this classic game is to wager the maximum of three coins. That way you will activate the highest pay table and start to bring in the biggest wins on offer. Relive the glory days of slots in this traditional 3 reel game!